Produced in partnership with Blade-Tech and field tested by the professionals at Viking Tactics, the 5.11 Thumb Drive Holster is engineered to be the safest and fastest-drawing Level II Holster on the market. 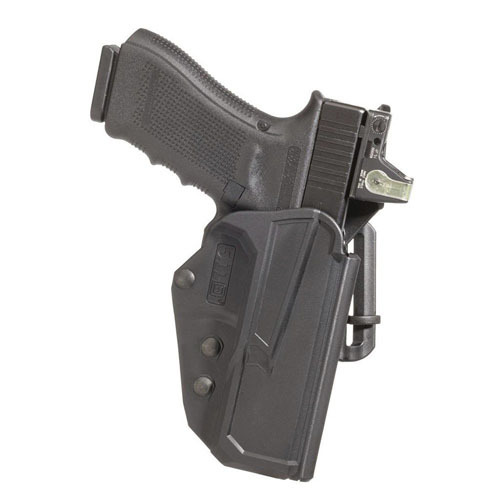 The exclusive single-thumb activated release allows a quick and natural release, while the reinforced retention system and removable Chop-Block switch guard prevent weapon loss during physical altercation. The Thumb Drive Holster offers a fully customizable installation, and optional Thigh Rig and Drop/Offset kits (sold separately) allow completely user-defined placement for maximum draw efficiency.